She was real but she held her pose very well! Today was our day to visit the ARoS Museum/Gallery in the city of Aarhus, and as it covers an area of 20,700 square metres that is distributed over ten storeys we planned to spend most of the day there. It claims to be one of the largest art museums in Northern Europe, and it's 'bumf' explained how it showcases extensive collections of paintings, sculptures, installations, and videos that are the work of many international artists, and apparently, we were to be 2 of about one million visitors which makes it one of the most frequented art museums in Scandinavia! So with such prestigious claims to fame, and because we'd seen pics of some of the 'works' both on the galleries web site, and those taken by other motorhomers we arrived with very high expectations, but if I'm honest, it didn't completely float our boats! Maybe that was because some of the things we saw were dramatic, some were inspiring, and some were gruesome, but some had meanings that were just so deep that they either just zoomed right over our heads - or we just couldn't be arsed to fathom them out! Now, I suppose I sound as if I'm being disrespectful because I'm sure the work that went into all of what we saw was vast, and some of the things like 'The Boy' were quite fascinating. He stands (or crouches) 4.5 metres high and weighs 500 kg and he almost seems alive because tiny details like the texture of his skin and body hair along with his piercing eyes make him look like he's watching all that is happening around him. There was also a very grisly scene of a badly injured couple fleeing after a grand piano had landed on them! 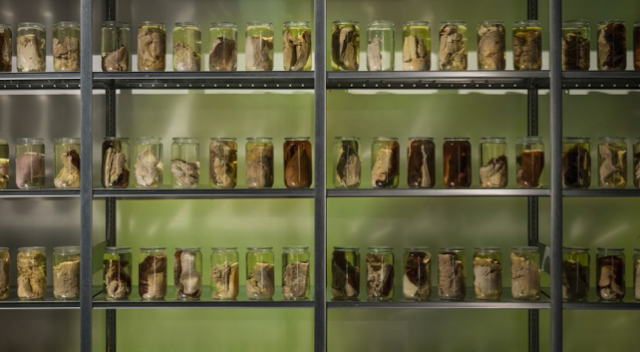 A Horse that had been dismembered and stored in jars! 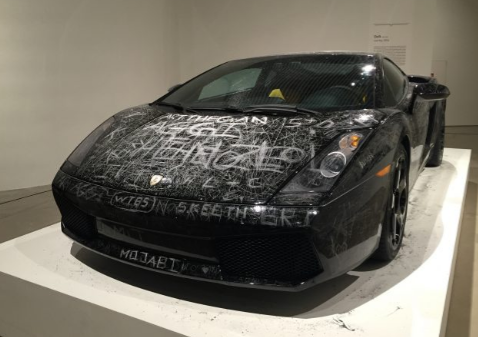 A car that had been scratched! A KKK man telling us where to go! but it seemed we'd missed the main event!! 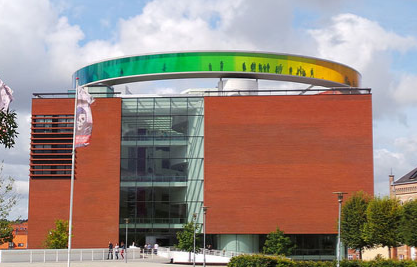 Then right at the top came the sky walk - a 150 metre long circular walkway that sits 50 metres above the ground on the roof of ARoS offering spectacular views of the city of Aarhus and the bay beyond - and the views come in a myriad of colours depending which window your looking out off! I enjoyed our visit but maybe on a different day it would have been better and that's because the exhibits that are displayed are constantly changed, or maybe as I've said before we're just philistines and should stick to our mountains and panoramic vistas for our entertainment. Having said that some of the street sculptures were very fine works of art and we got to see them for free. And me in the belly of a whale! When we'd completed our explorations we had a quick lunch in Burger King (last of the big spenders) and then tootled off in T4rdis2 to do some shopping before finally settling in another ACSI campsite near Ajstrop which will be home for the next 2 nights. After all the hussel and bussel of the city yesterday our ride today promised to be a tranquil toddle through the forest with just the calm Kattegat Sea and John for company - and it was - but along the way there was loads to see and delight us! 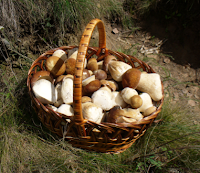 First came the foragers - we saw several groups that included small children with huge quantities of 'mushrooms' in their baskets - they looked delicious but even if we could have found any I'm mot sure if we'd have felt safe eating them! Our ride took us through the forests of Flojstrup, Moesgard, Skade and Thors (collectively known as The Marselisborg Forest), and here the track changed from gravel to a sealed trail that undulated through the ancient densely wooded areas, and eventually it led us to the outskirts of Aarhus. Once there we visited Marselisborg Slot (Castle) which is a residence of the Danish Royal Family and the summer residence of Queen Margrethe II since 1967. The castle itself isn't open to the public but when the Queen's not 'in' visitors are welcome to roam through most of the Palace Park and it was here that we found more interesting works of art with face parts depicted in most of them! But I'm not sure the face is the focus of attention here! Then after that exploration we nipped into another park that was located just in front of the Palace grounds - Minde Park - a huge green lush recreation area that stretched right down to the Bay of Aarhus. Here we found loads of beautiful old towering graceful trees and lots of picnic benches so it served us very well for our lunch, and it also led us to explore a limestone Monument that was erected in 1934 and engraved with the names of 4,140 Danes who were killed in World War 1. After that we started to retrace our tyre tracks in a homeward direction, but on the way we paused to visit Marselisborg Dyrehaven - a 22 acre fenced area which is free to enter and were large herds of Sika deer roam freely. Apparently this breed is really an East Asian species which was introduced to Denmark in the 20th century for hunting and to 'decorate' Danish Parks, but here they were incredibly tame and also quite cheeky - if you'd got any sort of food the whole herd was definitely you friend! They were very cute but I wouldn't have liked to eat my picnic within their reach! 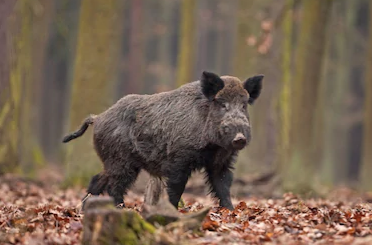 The park also has a group of wild boar, but for safety reasons the public aren't allowed in their enclosure but apparently it's from this species that all the pigs in Denmark originated! Our final stop was at a reconstruction of a Viking stave church and bell tower. Apparently none of the original church had survived but the floor, post holes and a piece of decorated plank were excavated in 1960. Inside there was nothing much to see but the field in which it sat provided a very welcome stopping point while we sat and munched scrumped apples and drank cool water. In the end our ride turned out to be much more entertaining that we'd originally thought and it would be very easy to spend more time here - but alas - our LPG (gas) tank needs filling and as there are very limited opportunities to do so in Denmark our next stop will have to be 70 miles south of here to get some! This morning we left Camp One in torrential rain but as our mission was just to get LPG the downpour didn't really bother us. The drive took about an hour and a half and when we got there our tank was soon brimming full - but because LPG is so rare here in Denmark it seems they can charge what they like - and they liked the extortionate price of about £1.40 a litre! However, needs must - and luckily the price was off set slightly by their cheap diesel which topped our tank up for the very agreeable price of 9.14DKK or £1.11!! After that we back tracked a little so that we could visit Skovsnogen Art Space - a wacky sculpture garden set in a forest. It's info said it would present contemporary and recreational creations - and maybe it did, but when I asked my dear husband to describe them he said 'absolute f---k--g rubbish'!! and added 'it wasn't art work - it was tantamount to fly tipping!' Can you tell he wasn't impressed! We came across musical pipes but couldn't quite fathom what they were playing! I think my Grandchildren could have done better! There was all sorts of other junk as well, and although some of it made us smile we didn't really think any of it was very artistic! Therefore, our visit only lasted about half an hour and then we were on our way to tonight's campsite which is situated on dunes between the Wadden Sea and the Ringkobing Fjord. This will be home for the next three nights so our next post will be about our explorations of this windswept location where, on clear evenings, the sun sets the sea on fire as it sinks into a watery grave. !